The Quantum Co-Evolution Unit: An Example of ‘Awa (Kava— Piper methysticum G. Foster) in Hawaiian Culture. The process of co-evolution occurs in many kinds of relationships and on various scales. One example of a co-evolutionary relationship is that of a plant and a culture with which it interacts. Such relationships are dynamic and ever changing. Researchers have discussed this concept and its implications for decades, yet no quantifiable unit or standardized scale has been accepted with which to measure this change. The theoretical “quantum co-evolution unit” (QCU) is proposed as the smallest measurable scale of interactions between plants and people. 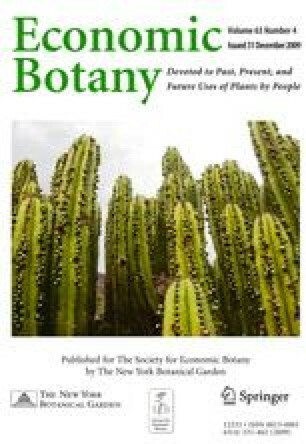 A collection of QCUs for a linked plant and human population would be its “ethnobotanical population.” This could be measured at various points in time to quantify the changing relationships between plants and people. These models set up a structure to discuss methodologies for quantifying co-evolutionary relationships such as are seen in the evolution of ethnobotanical populations. The co-evolving relationship between ‘awa (kava—Piper methysticum) and Hawaiian culture is used as an example to illustrate this idea. The authors thank the Association for Hawaiian ‘Awa, Jerry Kononui, Ed Johnston, Jonathan Yee, and Skip Bittenbender for many discussions about ‘awa and its changing roles in Hawaiian and global culture. We would also like to thank Kamana Beamer whose data collection and analysis has shed new light onto our understanding of colonial history in Hawai‘i. Conversations with Kim Bridges, Valerie McClatchey, Ghillean Prance, John Rashford, Rick Stepp, Michael Balick, Dan Moerman, Han Lau, Kamaui Aiona, My Lien Nguyen, Tamara Ticktin, and Mark Merlin have all contributed to the theories expressed in this paper. Kanahele, G. S. 1979. The Hawaiian Renaissance. The Polynesian Voyaging Society Archives, http://kapalama.ksbe.edu/archives/PVSA/Default.php. (1 March 2007).